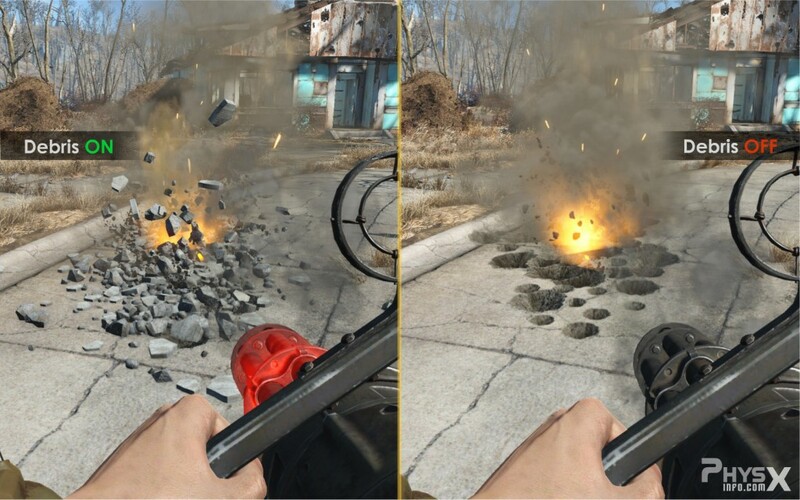 The debris effects in Fallout 4 are not that spectacular as someone could think mainly because they suffer from standard shortcomings of PhysX-style content added post-release – static game world with mostly non-destructible objects and excessive amounts of particles have some problems mixing in. One nice example, shooting a small object (such as a chair) can produce more debris than the volume of the object itself. This is quite, ehm, strange. However, the technical aspects of FLEX based debris implementation are very promising and we can wait evolving of this technology in the future. 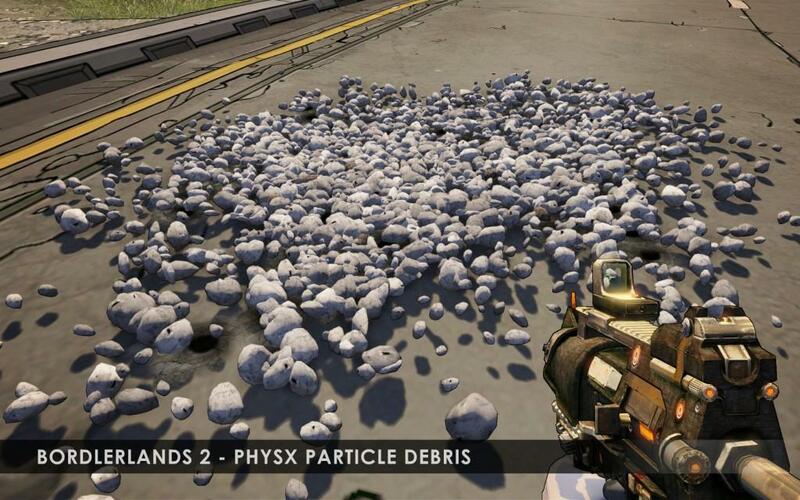 Particle debris for weapon effects are commonly used in GPU PhysX games, such as Alice: Madness Returns, Borderlands 2, Batman: Arkham City, Metro: Last Light, etc. Usually, a debris is represented by 3d mesh object (that can be fairly complex) in the graphical world and by simple dot-like particle object in the physics engine scene. Such approach is the most performance effective, but affects the realism in the negative way – debris rotation and secondary motion are “semi-faked” (approximated), collision with static objects are simplified and, more importantly, debris can’t interact with each other. Bottom line, FLEX solver, in comparison, support interactions between individual particles or particle groups. 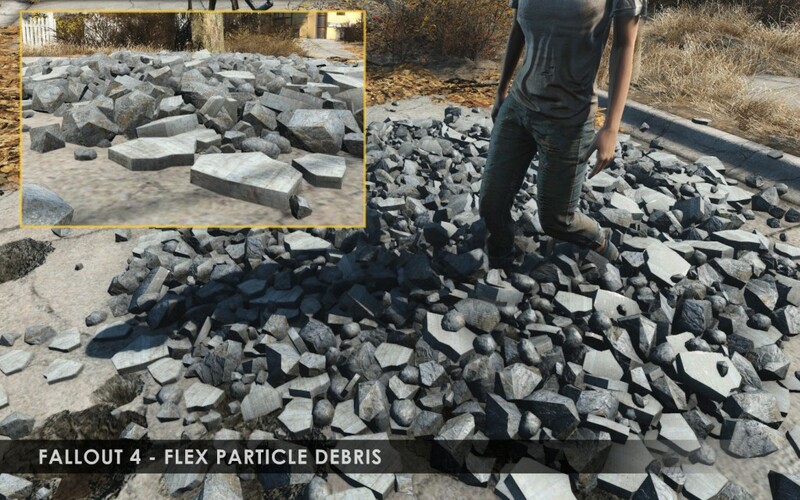 That result in much more natural and dynamic behavior – in Fallout 4, debris can even form a “volumetric” pile, thus acting like real rigid bodies, not simple particles (shadows are yet missing, yes).